Kissing the Witch: Old Tales in New Skins is a charming, if formulaic, little book of little stories retelling age old fairy tales from a very feminist slant. Technically it's a young adult book, though I didn't realise this until checking the details later - it is appropriate for both teenagers and adults. The stories are mostly very short, and told in the first person, by the girl - or woman - at the centre of them. At the end of each tale, the other woman in the story - whether witch, godmother, mentor, lover or rival - tells them their own story, about their past and how they came to be as they were, or possibly just about their past life (including some animal characters). And on and on, back through the generations, until it ends with a woman in a cave, a witch who has been kissed, longing for a girl with red hair who loves everything and has no story to tell. I like the way that the original stories are deconstructed, and gently shaken and turned around. In most cases, the witch is not the monster and the prince is not the happily ever after - but he is generally not blamed for this either. It's not his fault that girl after girl has grown up believing she must marry the prince, after all. There is no magic, and few perfect endings - in fact, due to the recursive nature of the stories, we already know the end of each one, when each character has moved into someone else's story. The repetitive first person narrative does blur some of them together, but it also makes the differences stand out. And it means that the teller can't hide from what they're telling you. "Kissing a witch is a perilous business. Everyone knows it's ten times as dangerous as letting her touch your hand, or cut your hair, or steal your shoes. What simpler way is there than a kiss to give power a way into your heart?" Only a handful of the stories definitely feature lesbian relationships or attractions, but almost all of the women could be - women who didn't conform, either through personality or circumstance, who looked or fell outside of themselves into the arms of other women. The Cinderella who does everything she thinks she should, then takes a better look at her Godmother; the Beauty and the Beast story, where the mask hides lips of red rose; Rapunzel who is blind and whose guardian tries to give her everything, even a prince; Snow White and her Stepmother - who used to be the maid from the Goosegirl story, and young and lovely and insecure, and ultimately rescues Snow White from herself. And the last story of all, or rather, the very first, of the witch who asked for a kiss. ...of a time when she did nothing but spin for her mother, miserably, endlessly, while her mother cursed her to her face and praised her skills to the heavens when calling up customers. And then her mother dies, leaving her with mountains of flax to spin. And she hires a simple girl, keeping her with promises of sisterhood and friendship, and finally the promise of her firstborn, and the girl spins for her, until she falls pregnant, and finally, as her Rumpelstiltskin walks away with her unwanted babe, she realises what she has lost. But it's too late - although, before she walks away forever, the simple girl tells her of her childhood. ...of being a princess, whose father went mad when he lost his queen and mistook her for his wife come again. And courted her with three dresses each of gold, silver and stars and the hide of his beloved donkey, and she ran away with them and eventually became a scullery maid, and then a mysterious princess, but her prince didn't recognise her under the dirt, so she went back to the wise woman who had helped her survive. And so on. All the way back to the very first story, of how came to be the barren woman who later was the witch for the girl from beside the sea, who gave her voice and walked her feet raw for her prince. The Tale of the Kiss - ...I'm not sure if this is a fairytale at all. 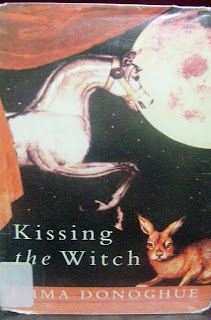 Kissing the Witch is not available on the Kindle, only as a book on Amazon.